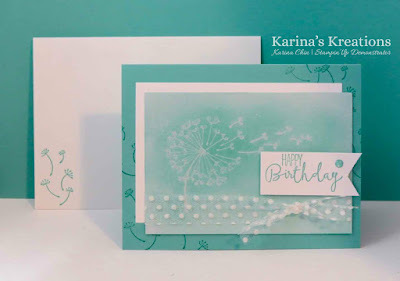 Karina's Kreations: Stampin'Up Dandelion Wishes Technique Card! Stampin'Up Dandelion Wishes Technique Card! 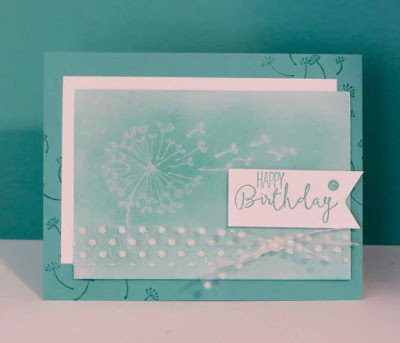 I love the dandelion stamp set because I can use it for a variety of techniques. This technique is called ghosting. I started with a piece of 3-1/4" x 4-3/4" glossy card stock and stamped the image with versamark ink. 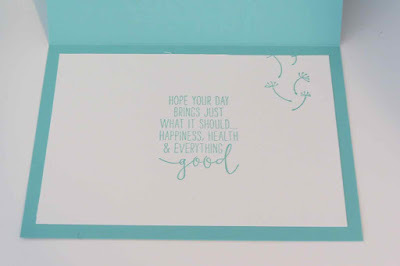 I sponged Costal Cabana ink over the image with a Stampin' Sponge. The more ink you add the clearer the image becomes. The greeting is part of the Special Celebrations stamp set #143885. This set has coordinating inside sentiments for all your card needs. I added some new 5/8" polka dot tulle ribbon and glitter enamel dots to the card. Live in Canada? I would love to help you with your order. Just click on a picture below to go to my online store or email me at kchin2@telus.net.